The truth is I'm still pretty much into the Met Gala 2014 red carpet looks. 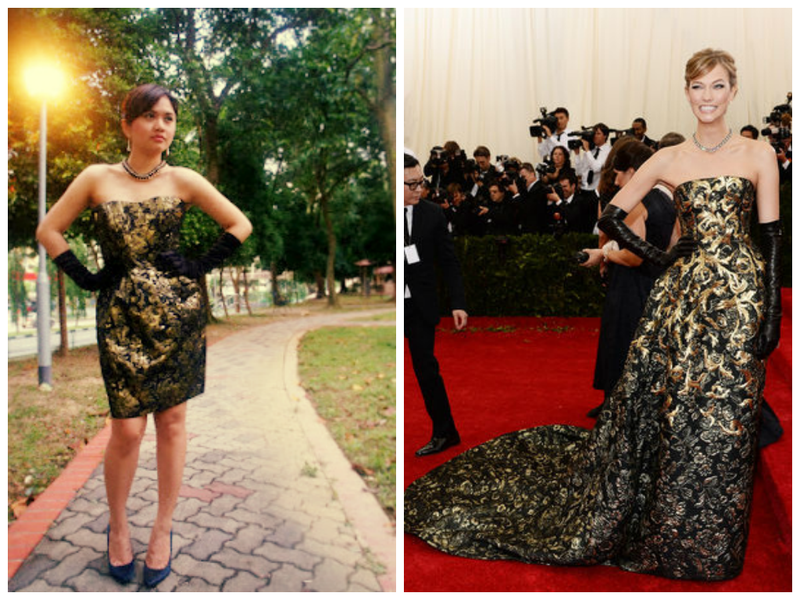 One reason is Karlie Kloss' Oscar de la Renta gown which pretty much reminds me of my $5 SGD Forever 21 Cocktail Dress. Yes, I agree with you that my cocktail dress is definitely is a far cry from her gown which probably costs thousands of US dollars. I know I was just daydreaming. Ahahah! Anyway, I did some fun shots of my cocktail dress last year during the holidays. You might want to check it out from this link, Lookbook : The Holiday Party Dress. Karlie definitely nailed the look and that Oscar de la Renta gown is just immaculate. So what do you think? Do you think there's some similarity with what we're wearing? Let me know in the comment section below. Smoking hot girl. Great dress.